Location: Carrickfergus in County Antrim, Northern Ireland. 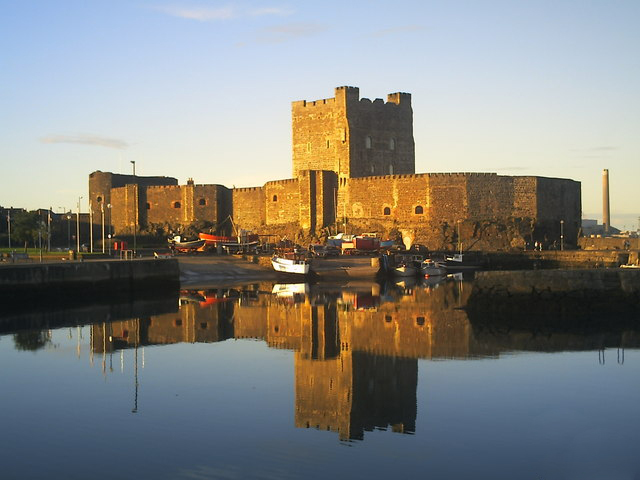 Notes: Carrickfergus Castle is a Norman castle in Northern Ireland, situated in the town of Carrickfergus in County Antrim, on the northern shore of Belfast Lough. Besieged in turn by the Scottish, Irish, English and French, the castle played an important military role until 1928 and remains one of the best preserved medieval structures in Northern Ireland. It was strategically useful, with 3/4 of the castle perimeter surrounded by water (although in modern times only 1/3 is surrounded by water due to land reclamation). Today it is maintained by the Northern Ireland Environment Agency as a state care historic monument, at grid ref: J4143 8725. In 1778, a small but significant event in the American War of Independence began at Carrickfergus, when John Paul Jones, in the face of reluctance by his crew to approach too close to the Castle, lured a Royal Navy vessel from its moorings into the North Channel, and won an hour-long battle. In 1797 the Castle, which had on various occasions been used to house prisoners of war, became a prison and it was heavily defended during the Napoleonic Wars; six guns on the east battery remain of the twenty-two that were used in 1811. For a century it remained a magazine and armoury. During the First World War it was used as a garrison and ordnance store and during the Second World War as an air raid shelter. It was garrisoned continuously for about 750 years until 1928, when its ownership was transferred from the British Army to the new Government of Northern Ireland for preservation as an ancient monument. Many of its post-Norman and Victorian additions were then removed to restore the castle's original Norman appearance. It remains open to the public. The banqueting hall has been fully restored and there are many exhibits to show what life was like in medieval times. It was built and re-built three times, and still stands today. "Carrickfergus Castle" (PDF). Environment and Heritage Service NI � State Care Historic Monuments. Retrieved 3 December 2007.